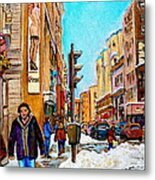 Downtown City Life is a painting by Carole Spandau which was uploaded on January 14th, 2010. 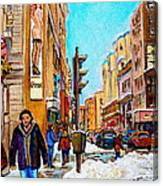 This Painting is by Montreal Street Scene Art Specialist Carole Spandau BFA BED. She has over 45 years painting experience, Immortalizing on canvas instantly recognizable beautiful and classic city scenes. From the1970s to today,she has been commissioned through 5 decades by discerning local clients and international art collectors to paint Personal Family Portraits,Charming Cafes,Historic Banks,Quaint Shops,Speciality Boutiques,Interesting Storefronts,International and local Restaurants,Churches,Colorful Corners,Hockey scenes,Montreal Memories and Laudable Landmarks from all over the various boroughs. 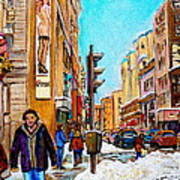 Montreal's Premier Streetscene Painter Carole Spandau is a lifetime professional career artist,fully credentialed:Officially archived with the "Createurs du Quebec" since 1971,listed with the Biennelle Guide to Canadian Artists in Galeries and Louis Bruens Guide to Quebec Artists as well as Quebec's "Guide Vallee", since 1985. 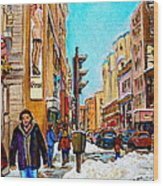 In 2013 her Plateau Montreal paintings were recognized and featured by the Montreal Museum of Archaeology and History,Pointe a Caliere for an exhibition tracing the living history of the neighborhood from the past to the present. beautiful Hockey Art with many Montreal landmarks,streets and shops. Over 1000 Carole Spandau's Beautiful Prints on Canvas,Framed Prints and Cards are available right here for custom order directly from Fine Art America. COLLECT MONTREAL MEMORIES ON CANVAS: HERITAGE AND VINTAGE,NOSTALGIC AND CLASSIC,Memorable paintings OF NEIGHBORHOOD BLOCKS,RESTAURANTS,CAFES,DEPANNEURS AND HOCKEY ART all available on this site. Very interesting effect Carole. Looks like a lithograph... I like your creative mind!